42 degrees for New Year’s Eve does not really incline one towards anything requiring hefty kitchen duty. We had planned to go to a friend’s house for a BBQ/drinks/casual get together. Eve the thought of hot meat was a little overbearing so I decided on the ultimate in simplicity. 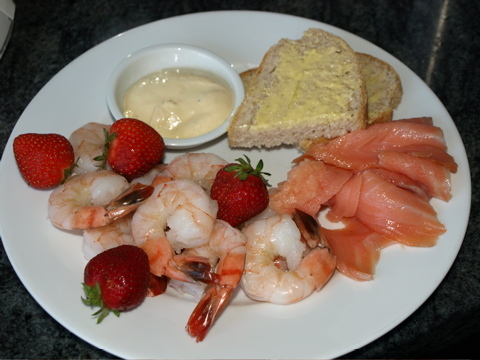 Individual platters of smoked salmon, prawns, strawberries and a little dish of homemade lime mayonnaise for dipping the prawns into. Plus some freshly backed bread and butter for piling the salmon on .Luxurious to eat and no trouble at all to throw together.